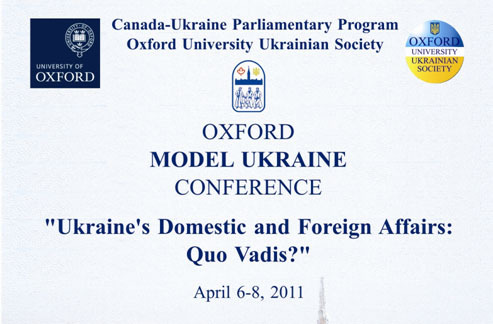 In April 2011, experts from across Europe, Canada, the US gathered in Oxford, UK to discuss leading issues in domestic and foreign affairs of Ukraine. The third Oxford Model Ukraine Conference took place at St. Antony’s College and New College at the University of Oxford on 6,7, and 8 April 2011. The conference was sponsored and organised by the alumni of the Canada-Ukraine Parliamentary Program (CUPP), and the Oxford University Ukrainian Society, in cooperation with the Russian and Eurasian Studies Center. Prominent participants included: Borys Tarasyuk, former Minister of Foreign Affairs of Ukraine, and current head of the parliamentary committee on European integration, HE Leigh Turner, the UK Ambassador to Ukraine, HE Volodymyr Khandogiy, Ukraine's Ambassador to the UK, Giorgi Vashadze, Deputy-Minister of Justice of Georgia, and Ambassador Jose Manuel Pinto Teixeira, Head of the Delegation of the European Union to Ukraine. Among the scholars of Ukraine and the region the conference hosted James Sherr of the Royal Institute of International Affairs, Andreas Umland of the National University of Kyiv-Mohyla Academy, Kataryna Wolczuk of the University of Birmingham, Andrew Wilson, University College London, Oxana Pachlovska of the University of Rome, and Oxford’s leading scholars including Paul Chaisty, Kalypso Nicolaidis, Alex Pravda and Sarah Whitmore. “This will be one of the more significant conferences organised outside of Ukraine,” said Toronto-based lawyer, Ihor Bardyn, Committee Chair of the Oxford Model Ukraine Conference. Oxford University Ukrainian Society President Anzhela Yevgenyeva, St. Hilda's College, announced that “The conference will draw talented students, prominent scholars, political leaders, and professionals from various fields, and may be the largest gathering of Ukraine’s best and brightest outside of Ukraine”. More than 100 individuals from Ukraine, Austria, Canada, Germany, Italy, the Netherlands, Poland, Portugal, the UK, and the USA attended for the conference. The Oxford Conference was the third in a cycle of four Model Ukraine Conferences, which brings together CUPP alumni and experts in government, economics, law, diplomacy, education, and health to share knowledge, experience, and ideas in order to improve democratic governance in Ukraine. The aim of the conference was to distil recommendations discussed and present a new model of governance to the Government of Ukraine. During the conference, organisers together with the Russian and Eurasian Studies Centre launched a fund-raising campaign for a Senior Research Fellow in Ukrainian Studies at St. Antony's College, University of Oxford. Duties of the Fellow will include: research and publication of new work on Ukraine, teaching of Master's students, supervision of postgraduate theses on topics relevant to Ukraine, and organisation of workshops, lectures and seminars, to promote new scholarship on Ukraine. In the first instance, this campaign is targeted at the creation of a five-year post. However, it will be part of a long-term initiative to endow a permanent post and create a larger, more diverse fund which will provide opportunities for scholarship and visiting scholars from the region.